One of our favorite places in South Carolina is the Center for Birds of Prey just outside of Charleston in Awendaw. It’s a wonderful place full of talented and compassionate people who rehabilitate injured raptors and also educate the public about avian conservation. Cameron and I usually visit while we’re in town, taking our cameras for some fun photo opportunities during the flight demonstrations. The featured birds included this Yellow-Billed Kite, a native of Africa, who is one of their best performers. In addition to catching treats in mid-flight, he also swoops down to retrieve pieces held by his handler, and we’ve never seen him miss and grab a finger by mistake. He wears a radio transmitter in the event he would get lost during a show, but he’s so focused and intent on his job that it’s hard to imagine him flying off. Each time we go to the center, we learn something new and return home even more impressed with the great work they do. Oh my……what an amazing picture! Thanks for sharing and the story as well. Are you sending a copy to the Center? I’ll bet they would love it. Thanks so much, Lucinda! I did post a link for them. Tricia – This is amazing! Thank you, Paul! I appreciate you kind words! I love raptors! This shot is amazing. Happy New Year. Thank you, Patti. Yes, if I could shoot raptors (or birds, for that matter) on a regular basis I would be in heaven! They are just such gorgeous creatures. Birds of prey are my favorite and this photo is fantastic!!! Thank you, David! This particular bird is so fun to shoot. 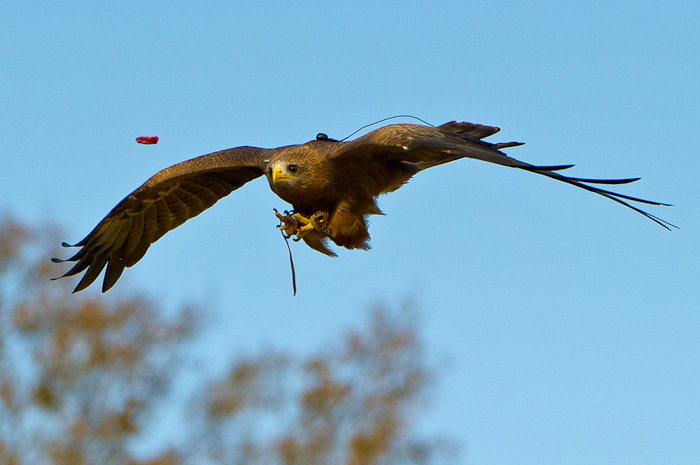 He just seems to make it all look so effortless and fun, even catching a piece of food in flight.